Although sadly no longer in existence, the foundry at R.A. Lister was probably the heart of the factory, where the raw metal was poured and shaped into intricate castings ready for machining and assembling into the machines which were sold throughout the world. The first foundry, started in 1867, was situated at the bottom of Long Street but this was soon expanded to cope with production demand. In the mid 1930s a brand new mechanised foundry was opened which allowed parts to be provided to the assembly lines as they were needed. This foundry continued through until the end although with modifications and improvements. In the late 1970s, the coke fired furnaces were replaced by electrically powered units providing much greater control of the melting process. Unfortunately though this didn't save the foundry and following the recession of the 1980s and increasing competition from abroad throughout the 1990s the Lister-Petter site was acquired by the South West of England Regional Development Agency and most of the buildings at the northern end of the site were demolished in 2002 and 2003. This including the foundry which had ceased working some months before. Note: for further views of the foundry buildings see the Factory 2002 slide show. 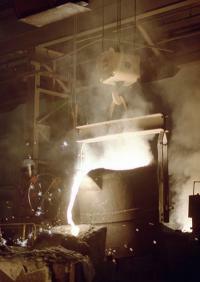 Pictured in the old foundry, white hot metal is run from a balanced cupola into a 15cwt ladle. The foundryman is adding nickel to the metal. 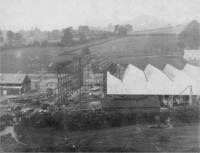 An early view of the construction of the new mechanised foundry. The new building, measuring 360ft by 170ft, was situated between a siding of the Dursley branch railway and a roadway, ensuring good access. Designed by F.J. Cook of Birmingham and installed by Herbert Morris Ltd the new foundry was said at the time to be the most advanced in Europe. 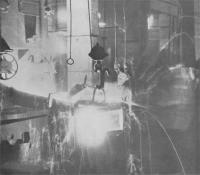 The new buildings housed a highly mechanised foundry which could handle 130 tons of molten metal in an eight hour shift. By this time new electric furnaces had replaced the old coke firing system with cupolas which dated from the construction of the 1935 foundry. Problems to do with the old system included inconsistent metal composition as it could not be analysed until after casting. Also the fumes and emissions resulting from coke firing made the cupolas difficult to clean. Geoff Noble and Peter Beresford inspect the performance of the new electric furnaces. 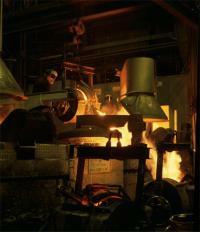 Molten metal is poured from the ladle into moulds during the casting process. Concentration showing on his face, this employee tends to his work in the foundry. 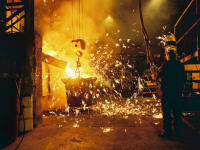 A dramatic view, giving an impression of the sheer energy on display in the old Lister foundry. 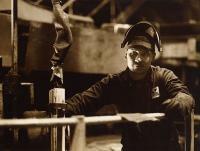 This picture clearly demonstrates the hostile nature of the foundry workplace. White hot metal metal pours from the ladle. In latter days there were three melting furnaces, and the melting was carried out using electricity, replacing the previous coke firing. 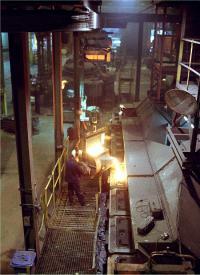 Each furnace had a capacity of 85 tons, enough to allow batch casting during the day shift. The other big advantage was that the iron could be analysed before casting saving expensive mistakes. The tall foundry melting bay stands shorn of its cladding as it awaits the final demolition.